When customizing the look of the Contact Form 7 plugin in WordPress, you might want to add your own custom classes to either your form tag, form’s individual elements or validation error alert messages. Validation messages use <span> tag that already contains classes defined by the plugin, so we could simply override those classes, but what if we already have our own classes that we want to use? This post will show how to add classes in validation messages and other elements in CF7 plugin. Let’s first examine, how to add our own class to validation alert error messages. We can achieve this using specific Contact Form 7 filter. 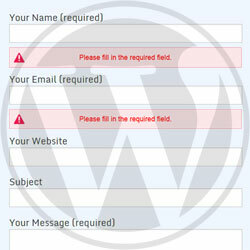 To add custom class to validation message, we need is to use Contact Form 7 wpcf7_validation_error filter. Add the following code to functions.php file. The $error variable contains the HTML code of <span> tag validation message. Inside the tag is a class attribute. The above code adds two classes named MyClass1 MyClass2 at the beginning of that class attribute using str_replace function. You can of course add as many classes as you want. Important!!!! Notice the blank space after MyClass2. This is needed, so that the plugin's specific classes that the $error variable already contain don’t get broken. If for any reason you don’t want to use filters, then you can simply modify styles of classes that the plugin already uses for validation messages. This is shown next. CF7 uses wpcf7-not-valid-tip class inside validation <span> element. All that is needed is to override that class. In the example below, we put the following code inside our main style.css file, to make the message fonts bold and dark red. To modify style of the field that failed the validation, override .wpcf7-not-valid class. Tip:For a nice example on how to style Contact Form 7 validation by overriding plugin's classes, check this article. What about other elements of the plugin? How do we add our own custom class there? This is shown next. To add our class names in other parts of our contact form, we don’t need to modify either functions.php or style.css. We can accomplish that directly from the Dashboard. Tip: To add an ID, use html_id attribute. 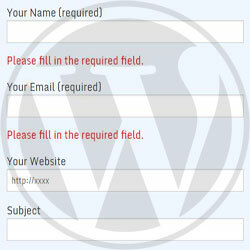 For individual elements, we need to edit Contact Form Tags in the template of your contact form. Here we are adding MyClass custom class to the required text field for the contact name. Contact Form 7 is a very popular WordPress plugin and to customize it using our own classes, we can modify classes that the plugin uses or we could add our custom classes to class attribute. In this post, we learned how to do that for <form> tag, for individual element inside the form and for validation error messages. If you found this article useful, please take a moment and share it on social networks or drop a comment below.